Looking at him now, it’s hard to imagine Jim Abel wearing a nice suit, carrying a briefcase and sitting through board meeting after board meeting. It’s been so long since he’s lived that life, Abel probably has a hard time imagining himself in that way, too. Now he’s just a man with a guitar, spilling his soul as he plays small to mid-size venues throughout the Kansas City area. A child of the 1960s, Abel said he’s now channeling his inner flower child that was somewhat suppressed during his years as a business executive in Chicago and Kansas City. A songwriter since his youth, Abel recently released “Thunder,” his first professionally produced album. The record was released on May 27 and can now be found in most of the Borders stores throughout the metro area. He can also be heard online at www.kccafe.net, an Internet-based radio station that plays only local artists. Next week, Abel will bring his unique style of folk and alternative music to Lee’s Summit. On Friday, June 20, Abel will perform from 7 to 9 p.m. at JP Coffee, located at 3390 S.W. Fascination Drive near the Metropolitan Community College–Longview campus. June is a busy month for Abel, as the Lee’s Summit gig will be one of 12 shows this month. In a “normal” month, he said he plays around six or seven shows. With the new album out, those numbers may continue to increase. Jim Abel is on his third career, having transitioned from corporate executive to stay-at-home dad to singer-songwriter. The Leawood-based musician who performs at 8 p.m. today at the Celtic Fox, 118 S.W. 8th, was a hospital holding company's vice president when he decided to quit working outside of the home in order to take care of his young son. However, now that his son is getting ready for his third year at the University of Kansas, Abel said: "I have more time. Being a stay-at-home father isn't quite as big a deal when your son is off at KU." That has enabled Abel to "focus on the songwriting and the singing," which he said were things he has been interested in his entire life. He has performed since he was high school and written songs since college, "but I never had time to get out and look for the bookings and pursue it very actively as I have the last three or four years." Abel considers himself a born-again "hippie with stories to tell." Although Abel performs a lot at bookstores and coffeehouses, he is at home at other venues, too, he said. "I guess I'm different from a lot of other singer-songwriters in that I have a wide variety of styles," Abel said. In coffeehouses and similar venues, Abel said he plays more contemplative songs, "more love songs," "more songs out of the Great American Songbook." "But I also play in bars," he said. "So when I play there, I can play some stuff that's more uptempo." "I can also plays stuff that's a little more bawdy, a little more risqué that I wouldn't play at a Starbucks," he added. "I really play the range, but it's all acoustic. Me and my guitar is my act," said Abel, who currently is doing gigs in support of his latest CD, "Thunder," which was released May 27 and is on sale at www.cdbaby.com/jimabel. Abel said "Thunder" is his best-produced CD to date, with its sound engineer coming from the well-known Kansas City, Mo., band, The Elders. You also can sample Abel's music at www.myspace.com/jimabel, where you can purchase tracks to download. "I really consider myself more of a songwriter than a singer," Abel said. "I sing because I enjoy it, but largely it's a way to be a better songwriter." "I sound a bit like the guy at the next campfire at your favorite music festival," he said. Investing and songwriting aren’t typically harmonious lines of work, but for one Leawood resident, the two career paths have struck a chord. Jim Abel has been writing songs since he was a young college student, but he never figured he’d make money with music. Now 60, he makes a living in investing and spends the rest of his time twiddling with his guitar and trying out new tunes. With eyes closed, Jim Abel rehearsed one of his songs recently in the studio of his Leawood home. Although Abel worked as a corporate executive for several years, after his son Ted, was born, Abel decided to focus on investing and be a stay-at-home dad. Now that his son is 19 and in college, Abel has more time to focus on his music. When he’s not watching the stock market, he’s at work in his home music studio writing contemporary folk music. He tries out new melodies on his piano and guitar and then records it using a computer program. He regularly performs publicly at local coffee houses and pubs, and often meets up with the Kansas City Songwriters Circle to try out new songs. Sometimes his songs are personal and detail stories about his youth and his family’s history, and others are funny and aimed at society. Abel is at ease with a guitar in his hands, and as he sings, his calm voice transfers his listeners to a different time and place as his fingers softly strum the guitar’s strings. The song narrates the story of Civil War photographer Mathew Brady, whose collection of battlefield photos were popular during the war but fell out of favor after the war ended. Some of the glass negatives were sold as glass and used in greenhouse windows. Abel calls himself an unrepentant hippie, and many of his songs are political and influenced by his involvement in the antiwar movement as a youth. “I still believe in all those simple things we believed in the ’60s,” he said. As he sings a humorous political song, “Modern Diplomat,” he takes on a noble air and belts out the words as he delivers one tag line after another. “I know what form your government should take/I know what sort of bidness deals to make/and if it suits me there’s no promise I won’t break/That’s the way of the new diplomat,” he sings. Even though many of the songs are personal, Abel isn’t shy. Instead, his music gives him freedom. His wife, Deborah Hays, said she’s not a musician but has always enjoyed her husband’s talent for songwriting. “He really puts his heart and soul in everything he writes,” she said. She said that folk songwriters like her husband don’t have a huge following. However, their songs are clever and each word is chosen carefully, making for an enjoyable performance. Leawood corporate executive turned singer/songwriter is making his mark on the Kansas City music scene. Singer/songwriter Jim Abel may not have a record deal or a top-20 hit, but this former corporate executive and Leawood resident has made his dreams come true, proving it's never too late to make a change. Growing up, Abel's father played a significant role in the way that he would learn to appreciate music. "My father grew up in the 20s, 30s and 40s, so he loved movie musicals," Abel says. "To me, that particular influence is very evident in all of my music. I've been listening to the American Songbook since I was a kid. People like George Gershwin, Cole Porter and Rodgers and Hammerstein are high on my list of greats." Abel says his unconventional musical style also draws influence from legends such as Bob Dylan, Steve Goodman, Janis Ian, Woody Guthrie and Tom Paxton. "It's not the type of music you hear on the radio, so I really never know how people are going to react," Abel says. "Twenty years ago, I would have called myself a folk singer, but now I'm not sure exactly what that means. I think my sound is more of what people today call 'indie' music. I write songs in which the lyrics matter in a big way-a much more significant way than in conventional music played on the radio." After attending Wheaton College in Wheaton, Ill., Abel moved to Boston to work for a small company doing research and development for the automotive industry at the time that the Clean Air Act came to be part of the country's legal framework. "One day, while I was working in Boston, my boss asked me what I would really like to do," Abel recalls. "I'm sure he had something totally different in mind, but I replied that I really just wanted to write songs. He looked at me as if I were insane. Needless to say, he's still a businessman. I write songs." Abel then became part of the Austin Scholars program at the Kellogg School of Management at Northwestern University before accepting a position with a healthcare consulting firm in Chicago where he became a top-level executive at an expedited pace. It was then that Abel made the move back to Kansas City to care for his aging parents while working for Research Health Services. After a few years, Abel resigned from his position at the Kansas City-based company and took a year off to travel extensively. "Some people might say I just can't hold a job," Abel says with a laugh. "I just needed a break." Upon his return, Abel became a full-time private investor, making the move to part-time when his son Ted was born. "I've always tried to really be around for my son," he says. "A job with flexible hours allowed me to do that." But two years ago, when Ted left home to attend college at KU, Abel picked up his dream right where he had left off so many years ago. 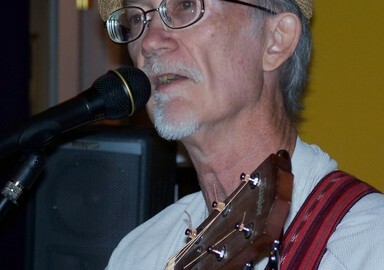 Abel began attending meetings of the Kansas City Songwriters' Circle, an alliance of Kansas City singers and songwriters who get together and play for one another on a regular basis. "When I started going to the Songwriters' Circle, I was immediately struck by the quality of music I would hear," he says. "There is so much good music to be heard in this city, especially out south, and the incredible thing about it is that these are not full-time musicians. These are people with day jobs and very full, busy lives." Garnering positive encouragement from the group of singers and songwriters and gaining notoriety from others in the community, Abel began to book gigs at cafes and coffeehouses throughout the city, all the while continuing to write original music. Additionally, Abel writes songs about more serious, progressive issues such as politics and the environment. "I don't want to enrage anyone, but I do want to inspire people to think," Abel says. "I'm a product of the 60s after all. I am an unrepentant hippie." Through the years, Abel has been invited to play at Kansas City hot spots such as the Main Street Coffee House, the Roasterie Café and was the first ever singer-songwriter to play at Starbucks on the Country Club Plaza. Recently, Abel has begun playing gigs at Foo's Fabulous Frozen Custard in Leawood as well as at Johnson County Community College. And this winter, you can catch Abel at the Daily Dose at 135th St. and Quivira Ave. on Feb. 2 from 9 p.m. to midnight. Abel also plans to play on the patio at Spin! Neopolitan Pizza in Overland Park come spring. But for those who can't make it out to see him perform in person, Abel has three CDs available for purchase and is currently working on his fourth to be released in early spring 2008. His newest album will focus entirely on the concept of relationships and includes numerous pure love songs as well as a plethora of humorous numbers. I lived the 60s and I remember them. In the course of time I became a misfit corporate executive. After a longish stint as stay-at-home dad, I am once again reborn as a hippie, with stories to tell. I sound a bit like the guy at the next campfire at your favorite music festival. My influences start with Broadway: Cole Porter, Rodgers and Hammerstein. As a high schooler I made a long expedition to the main library in search of Woody Guthrie. Then came The Band, Bob Dylan, Eric Andersen, Janis Ian, Bruce Springsteen and John McCutcheon. All seasoned heavily with Tom Lehrer and Flanders and Swann. The reason I write songs, however, is the incomparable Tom Paxton. I do original songs. A typical set will include a mix of the funny and the serious, sometimes in the same song. I do off-beat love songs and I have some bawdy drinking songs if the venue suits. I have political songs for political gatherings. I will play anywhere from 20 minutes to two hours: if you like what I do, you will like the entire set. If not, heaven help us both! Mary, in the meadow in pale summer light. Mary, in the schoolyard with books clasped tight. seems like a last gift from my Mary dear. Morning, when the last of the stars disapear. Morning, when her odd laughter I'd first hear. still sounding so clearly I hear it all. Missing, all the secrets she once helped me see. Missing, the shy way that she looked at me. show me her loose hair and unwrinkled brow. Meet me, if just once in the dreamtime today. Meet me, before life takes us both away. where ships leave their cargoes of broken rhyme. I watched you for hours as I've often confessed. We swore we'd live separate, it would be for the best. Not quite together, but never far apart. Sometimes nearly strangers, we're still joined at the heart. We never knew until later we were so firmly caught. We might act like strangers, but we're joined at the heart. I've always been with you, although you're rarely here. Cover to cover, each to our self. We could never be strangers, we are joined at the heart. and a friend is always nearby. more than a home to me . . . Ireland. to the Mourne's broad shoulders up in County Down. where the sun hides in the western sky. how in Bogside and Derry the scars and hate remain. and a peace that springs from the land. and my friends all, by god, claim to hail from the old sod. when the world says heaven it means Ireland. Antietam and its horrors weren’t in fashion anymore. mute reminders of a war they feared would never pass. for sun and moon and stars to see. contains the soul and the heart of history. he truly was no hero, nor lived a coward's ways. He might have fought for North or South, he rarely thought of home. He lived for simple pleasures and later went to roam. instead, I bring you to this place I try to carry on. I was not a soldier; I have no use for war. No one's life is easy; my life has been good. I may leave no mark behind; I'm not sure I should. But ask your Dad for stories of my brothers and of me. Then you decide if what you hear will fit with what you see. Smile when you want me. Laugh when I please you. Call when you need me. as your harbor from the sea. Lay your head now on my pillow. Let your thoughts be calm and warm. I will keep you from the storm. send worry where the winds go. None can harm you. I am here. I bring healing to your pain. My clear sunshine dries the rain. Let me bring peace to a world of war. Let me bring hope to suffering poor. Let me bring justice where evil prevails. Let me endure when all else fails. Let me see light when blackness fills my soul. Let me help make the world whole. Let me be better for the sorrow of us all. Let me remember the people above all. to clasp our hands, sing our songs and never bow our head. I ask this for tomorrow, I ask this for today. Renew our dedication to the peace of all, I pray. May we find harmony in our separate songs. May we humbly forgive our common wrongs. May we link hands to rebuild what is lost. May we reach out to share the cost. May we turn the weakness of many to strength. May we with grace extend our love to its full length. May we walk stronger for the pain that we have borne. May we remember the ones who died that morn. These rich gifts we all should receive. This, I trust, we all must believe. Summer had deserted us, gone on its annual trip. Blissfully unaware of my life's wintry ways. above me the countless stars of peace in glory abound. and all of creation was giving birth. as eagles passed them by without a glance. Earthly creatures, I saw all their colors and I heard their call. A magic glow embraced them all in one great dance. of every race and creed, not one in need. Long night overcome by day . . . in my dream. People of every land were standing hand in hand. Nearby a mighty band played all along. Amazingly, it seemed to me as if they were a family. In close and simple harmony they sang one song. no shiny trinkets, wrapped up so tight. Would we still have Christmas, would we still care? What good is Christmas, with no presents there? what would be in such a Christmas for me? scatter the first fruit to meet others' need. fortune and poverty in the same line. luck of the draw what is yours and what's mine. Could we have Christmas, just in our heart? not as a finish, but for a start? What use is Christmas, one day a year, if not an answer to sorrow and fear? never once has that happened before. if we sow hatred the rest of the year? if for a few days the fighting would cease. That would be Christmas, a miracle true. To bring joy to all of the world and to you. Show me an orphan who's not on the street. Point out the homeless with plenty to eat. Tell of a widow no longer poor. Give me an idea what Christmas is for. Then I imagine it just might be there could be hope for a world fair and free. Or maybe it's just part of some foolish dream. What do we do when the storm is rising? What do we do when the sky goes to ground? Do we cover up and hide in the cellar? Do we pull the drapes to muffle the sound? the candle is lit the fire will burn. the parties begin and end with a shout. The light'ning may rip as if it had soul. Give reason the slip when the thunders roll! The music is loud, just as it should be. Wear those red shoes, I'll put on a black hat. You won't need a gown, our storms are not formal. Now kick off the shoes, I'm waiting for that. The saxophones moan, the thunder their partner. Heaven's own light show reflects on the band. What do we do when the storm is fading? What do we do when the gods are done? Open the drapes and hope for the sun? the candle's still lit, our fire still burns. Join me in a chorus. Let our voices chime! hold tight to that moment before it is gone. make welcome an old friend you just chanced to meet. a new beacon rises, perhaps as a star. brings more to the season than bright lights and snow. the different faces our mirrors reflect. all brothers and sisters to you and to me. while Sean and O'Riley and my cousin Kiley were poundin' their heels on the face of the earth. The rest of the band were at best out of hand and everyone shouted how life is just grand! and Jenny O'Farrell stood all by herself to watch the parade pass on by. and every young buck who is lookin' for luck is convinced that his star will be risin' today. and as for tomorrow no one gives a damn! But Jenny O'Farrell keeps still to herself to watch the parade pass on by. but on this parade day he dressed in a gay way and seemed to be rid of his cares for a while. He joined in the singing, his voice like a bell ringing, clapping and tapping like some other man! When Jenny O'Farrell came into his eye just as the parade passed her by. Martin McCurry dropped out in a hurry and marched in a confident way to her side. Jenny saw Martin and hardened her heart for a moment but saw there was no place to hide. But Jenny O'Farrell stood silent and sure to watch the parade pass on by. So now you've come to me, so you've come to woo me. You think that I'll fall at your feet with a sigh. I am one who knows when what I have been seeking falls into my hand! So Martin McCurry step quick by my side before the parade passes by. butter my biscuit and fill up my cup! With holes in my pockets and crumbs in my beard I'll not let the parade pass me by. They're hauling down the flag a - gain today; another great American is dead. with lowered eyes and quiet nodding head. The body lies in state for all to contemplate the sacrifice of service that he gave. another soldier finds a lonely grave. They're hauling down the flag again today; another great American is dead. Not a Pres i dent, but one the politicians sent, to draw a line of policy in red. He did as he was told. She never will be old. War for them is over now, at last. Whatever we believe everyone of us should grieve, and see each day our flag flies at half mast. let's fly the flag at half mast and think of what we've lost. now a sat in pillow cups her head. She might have been a hero but probab ly was not, it took all she had just to do her job. the flag at half mast is the least we owe. let's fly the flag at half mast and think of what they gave. They're hauling down the flag again to day; anoth er great American is dead. for just another soldier now forever still. I am a modern diplomat. not a wimpy lib’ral or a democrat, but a modern diplomat. I represent the best in man. I'll buy your friendship if I can. If you won't join us then you'll be damned to be our enemy. We don't need the help of our so-called friends; that is so last century. When all's said and done it takes only one to be the voice of destiny. We'll extend the blessings of our land to the corners of the earth. but in these troubled days only we know what your land is worth. and I'm not the least ashamed to tell you that I know better than you. and if it suits me there's no promise I won't break. That's the way of the new diplomat. We no longer live in a world of laws. We're not bound by treaty. There's no need for us to seek a common cause when our truth is plain to see. “Please save us from ourselves”. I'm a twenty-first century diplomat. (just as long as that someone is me). the boy unaware stares out over the crowd. waits for the boy to look her in the face. I dance on by, just a few steps away, waltzing my darling again. I hope that boy doesn't close out this day, with no regard where he's been. Has he any idea of the full extent of her charms? that he holds right there in his arms. not yet a beauty, but promising more. hints of the woman mature. too rich to let by. lovers circle their partners in vain. lured by enchantment, turned back by fears. hands, eyes and face all awhirl. did he go back for the girl? To move along you must take that first step. You have a choice each day that you draw breath. a fence needs mending almost from the start. if we accept the challenge as our own. Are the superheroes every child should see. it's bridges, not just walls, we need to mend. to all the world and right her in our land. To move along we must take that first step. We have a choice each day that we draw breath. I live alongside someone who lives 'longside of me, as interconnected as two people can be. All around us some other lovely people reside. Here on this planet we have nowhere to hide. What my neighbor does not need he tosses away, to collect in my front yard the very next day. When I do the same thing to the next neighbor below,he passes it along until there's nowhere to go. I live downhill from someone who lives uphill from me, as interconnected as two people can be. Further downhill some other lovely people reside. Here on this hillside we have nowhere to hide. soon the water comes to me with a funny taste. I use it the best I can and then I throw it out. But it will come around again, of that I've no doubt. as interconnected as two people can be. Further downstream some other lovely people reside. Here on this river we have nowhere to hide. warm our homes, run factories, with oil, coal and wood. the next day it comes back to us, a gift from the rest. I live downwind from someone who lives upwind from me, as interconnected as two people can be. Further downwind some other lovely people reside. Here on this prairie we have nowhere to hide. Every day so many small decisions come down from the politicians on the good side of town. and whether I think of what I am doing to you. I live downtown from someone who lives uptown from me, as interconnected as two people can be. Further downtown some other lovely people reside. Here on this island we have nowhere to hide. you never hear sleigh bells in Cork or Wicklow. but I'll tell you a story of one Christmas night. so I threw on my coat and I ran to the park. There was just the moonlight and me. Thousands of snowflakes covered my eyes. Diamonds and dewdrops were all I could see. I piled up the powder close by the Great Stone. The air became still as I struggled alone. while I carved a small statue no larger than I. The snow became heavy, the night grew full dark. Soon it was too late to go home from the park. for he soon came to life with a smile in his eyes. huddled in the night with my friend. "Good cheer and fortune be yours without end!" I saw my snow friend somehow stolen away. as if called there by powerful ancient snow charms. each a talisman still of that magical night. a magical snowman, shamrocks in the snow. bringing life and great cheer and good fortune to all. and may we bid welcome to friends large and small. and may we find always shamrocks in the snow. I gaze out the window as snow dusts the ground. The season has turned once again. I walk to the corner as lights start to glow. I visit the home of a friend. the bountiful gifts and the tree. one candle warms my family. the People oppressed once again. the Syrian army was slain. with no oil to keep it ablaze. For eight days the lamp stayed alight. a stranger my neighbors don't see. Christmas is your blessed time. would notice this small light of mine. We light the first candle each day after dark. Each night we light one candle more. reminding what we struggled for. when first they arrived in this land. I place it with love in their hands. I share the excitement they feel. so different but equally real. Each greeting I hear is the same "Merry Christmas"
and I send my best wish to you. and pray both our wishes come true. proclaiming a peace unlike any before. a new dawn breaking once more. There used to be wise men who dared follow new stars. claiming that angels were guiding their way. Are they all gone now, from earth and the heavens? Do we still seek stars today? with eyes that were made for the earth. mistaking high price for great worth. The rays of the sun will run on forever. The truth in a story once told never dies. and we may yet grow wise. It burns through the night to keep fear at bay. in signs sent from afar. and reach out for the stars. So cling to your Star and follow it bravely. Remember the glory when first it appeared. and may hope drive out fear. The April rain came a blessing on us all. Each year we fear the rain might never fall. It's four months on and the summer's come a curse upon the land. Bend to the shovel. Move the sand on down the line. Now bend your knees, heave the bags in double time. The water's still rising on the Platte and Cedar, and right where we stand. The River knows nothing of plans made by man. Heaven, uncaring, has baptized the land. We start every morning just a few feet further back. Retreat before the overnight attack. We stack the bags a few rows higher, certain how it ends. The River's not angry. The River is no fool. Men build levees but the River makes the rules. The River is endless and the light is fading. One more night has come. The drumming rain had made its final call the day the River overtopped our wall. The water's receding just a few days late. Coffins lie scattered by the water overturned. The heavens are empty but the River will return. Soon some will tell of how we fought the water, as if we had won. Heaven cares nothing for man and his plans. The River, unsparing, has baptized the land. Raise up your strong arms and work for peace. Throw wide your door to freedom's sweet release. your ev'ry move an instrument of love. Give us a new song to play for peace. Strike a fresh chord for freedom's sweet release. Raise up your voice now and speak for peace. Proclaim the way of freedom's sweet release. to make each move an instrument of love. Open your heart to the beat of peace. Feel the strong pulse of freedom's sweet release. march on till justice reigns.